Sadly I was in a big hurry when I went thought Cranbrook and I was not able to do a full tour of the brewery. 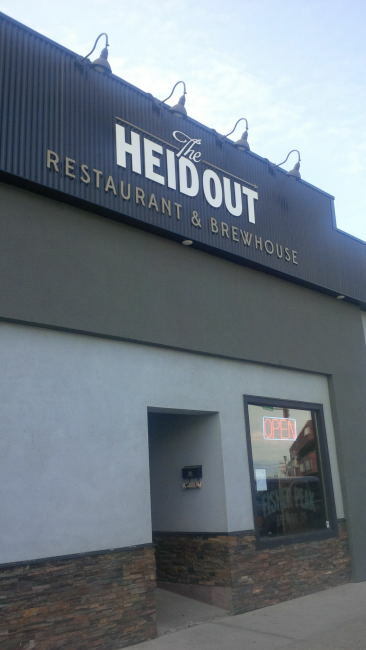 I did still find time to stop by the Heid Out Restaurant & Brewhouse. The brewhouse runs under a different name and is called Fisher Peak Brewing Co. The brewery is named after a local iconic mountain Mount Fisher. When you walk in you find a nicely setup brewpub restaurant with a nice full bar. Beside the bar behind some glass doors you can see the brew kettle and mash tun. Sadly the rest of the brew system is in the basement and I did not see it. The brewery does growler fills off of taps of all the beer that they have on tap at the time. When I was there they had 5 or 6 beer on tap two of which I got fills of and will have reviews of. I wish I had more time to enjoy this place and have a bite but when you are on the road and dealing with big distances and traffic through some of the centers like Cranbrook plans can change in a heart beat. If you are heading through this area of the Kootenays though you really should stop in and see what you think. You could event let me know how their food is! This entry was posted in Brewery and tagged beer, brewery, brewpub, craft beer, craft brewery, cranbrook, fisher peak brewing co, kootenays, The Heid Out Restaurant & Brewhouse, The Heid Out Restaurant and Brewhouse.